Theee two must be thrilled they are on Rod Laver as they thought that they would be put far outside. But, they are on center court. The Czech will attempt to strike aces one after another while the German will try to whip her big forehand. A few years ago, Goerges looked like she was ready to reach the top 10. She did not, fell and she has been more suited of doubles. But she looks more composed and she will run around Hradecka and will triumph in three sets. Federer has to face two Italians in a row? Yes he was upset after dropping his first set against Bolelli, but he turned it around, charged inside the baseline and twisted the match to his favor. Now he can be more patient against Seppi, who is very steady but who isn’t a huge hitter. Seppi will try to trouble Federer’s backhand, but the Swiss has way too many weapons and will win it in straight sets. 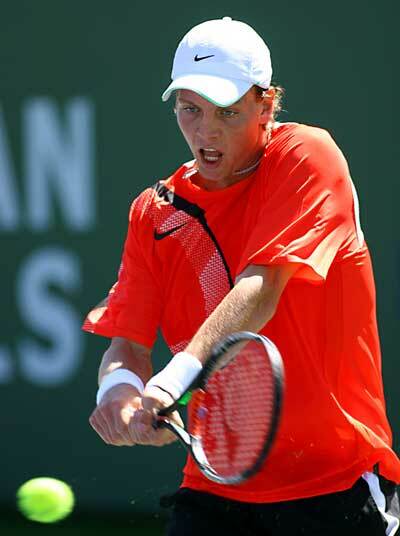 Berdych faces a test against Troicki. Sharapova nearly fell to Panova; a very talented Russian who played one of her best matches ever. Still Maria survived and while she was up and down, she still went at the lines. Fortunately she did it at the right time and now she will be more patient. Diyas is very consistent and can run from side to side. But, she hasn’t proven that she can smack the lines. Sharapova will win in two sets. The Spaniard almost went down when Tim Smyczek, who had him on the ropes. As usual, Nadal never gave in and pulled off an incredible five-setter. This time though, Sela is a different player. The Israel is intelligent and can mix it up, but Nadal should feel better physically and overwhelm him with some massive forehands. The lefty will win in straight sets. This is an intriguing contest. The Czech Pliskova has improved vastly over the past year while the Russian Makarova has finally come of age. Makarova reached the 2014 US Open semifinal, while Pliskova just reached the Sydney final, nearly upsetting Petra Kvitova. Makarova can move from side to side, while Pliskova can hit it anyway she wants to. The Czech can sense that she is almost there and can go deep here. She will win in three sets. The tall Czech hasn’t been specular in 2014 and the start of 2015, but is he really ready to make a move of the Aussie Open? I doubt it, but Berdych could slip into the quarters. He usually does that, right? The Serbian Troicki played very well to win Sydney, but we will have to play much better to beat a top-10 guy. He is fast enough to bring it in five sets, but Berdych will grab a break and hold on to win it. The Romanian has improved quite a bit over the past year. She believes that she can win a Slam, and perhaps she has a true shot, but Mattek-Sands has beaten her before and she can take over the net. The American likes to get the ball on the rise and she loves to attack. She can pull it off, but Mattek-Sands was hurt a lot of last year and needs a few months before she hits 100 percent. Halep will live in three sets. The Brit has had a very easy draw and will yank Sousa in less than two hours and win in three sets. Both of the Aussies have played well over the past weekend and a half. They know each other very well, and both can smoke first serves. But they are different in other areas. Tomic can change it around, while Groth is more straight forward, going to net any chance he has. Groth would be thrilled to reach a fourth round at a Slam, but Tomic knows what he is going to, pulling him around side to side and back and forth until he caves in. Tomic in four.